Summer squash are the stuff of legend. Farmers love them because they survive even the hottest Texas summers, and they’re one of the most prolific plants around. Home cooks love them because they’re inexpensive and tasty. The only downside to summer squash season is figuring out what to do with all of it! "Summer Squash" by Ayngelina. Available under a creative-commons attribution license. © 2008, Ayngelina. We’ve got you covered. Check out these cool ideas for how to use the army of zucchini and yellow squash that arrived this week in the Local Box. 1. Grate the squash and use it to cook low-carb hashbrowns. This is so simple: to each cup of grated squash, 1/4 cup grated onion and an egg white. Heat a few tablespoons of oil in a skillet and cook the hashbrowns over medium heat just as you would potatoes. 2. While the grater’s out, grab another squash and some gin to make a Zucchini-Tini. "Martini" by Quinn Dombrowski, available under a creative commons license. © Quinn Dombrowski. 3. Oven baked zucchini chips are kid-friendly and would make a terrific addition to a school lunch box. To make them, slice a zucchini as thin as possible with a mandolin or sharp knife. Toss the slices in a few tablespoons of olive oil and season to taste with salt, pepper, chili powder and paprika. Bake the slices in a single layer on a cookie sheet lined with parchment paper. It will take about two hours on your oven’s lowest setting for the chips to become crispy. "Zucchini Chips" by Ina Todoran, available under a Creative Commons license. © 2010 Ina Todoran. 4. You don’t really need to cook squash at all to enjoy them. Slice a few squash into 1/4 inch rounds and dip them like chips in Zucchini Hummus. 5. Most people have a favorite zucchini quick bread in their recipe box. This recipe for zucchini bread is unusual because it combines shredded zucchini with a traditional yeast dough, resulting in a perfectly tender cinnamon raisin bread that can be made by hand or in a bread machine. 6. Grilled zucchini is a cheap way to feed a crowd at a Labor Day cookout. Just slice a few summer squash lengthwise into 1/2 inch slices and toss in a bowl with Italian dressing. (About 1/4 cup dressing per squash.) Grill the zucchini slices until they’re tender, about 4 minutes per side. "Grilled Zucchini" by Another Pint Please, available under a Creative Commons license. © 2009 Another Pint Please. 7. Another recipe for the grill: Grilled Sausage and Apple Stuffed Zucchini. This one would work with yellow squash or zucchini, but I think that acorn squash would be killer with the sweetness of apples. The Asian pears in this week’s Local Box would substituted well for the apples, too. 8. These zucchini dessert squares are like a traditional jam bar, but with a sweetened zucchini filling. You won’t believe it’s zucchini when you eat them– the filling tastes just like apples! 9. While we wait for pumpkins to come into season, try this zucchini pie recipe. I actually love this dish for breakfast. It really does taste like pumpkin pie, and I make it a little healthier by skipping the crust and baking the filling directly in a buttered pie pan or 8-inch square casserole dish. 10. Not a fan of zucchini pie? Elise Bauer’s popular zucchini chocolate cake should do the trick. "Chocolate Cake" by A Whisk and A Spoon, available under Creative Commons License. 1. Add thin slices of cucumber to a pitcher of water and refrigerate. After a few hours, voila! Refreshing cucumber water. 2. Make a Lean Green Smoothie by blending together a sliced cucumber, 3 cups of chopped honeydew melon, 3 cups of ice cubes, and a handful of fresh mint. 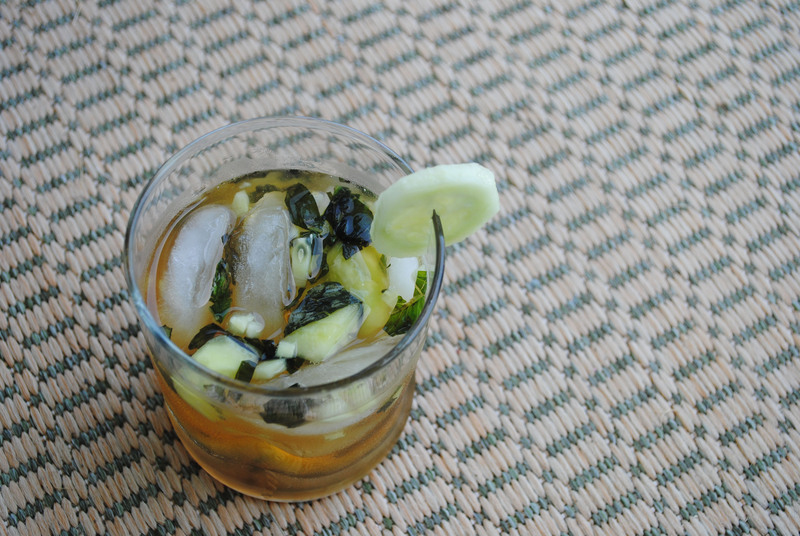 Garnish with mint and a slice of cucumber. 3. Let the kids help make Cucumber Raita. Kids can grate half a cucumber and mix it with 8 ounces of yogurt and a sprinkle of garlic powder. Grown-up should slice the remaining cucumber, plus additional veggies such as radishes, carrots or squash. 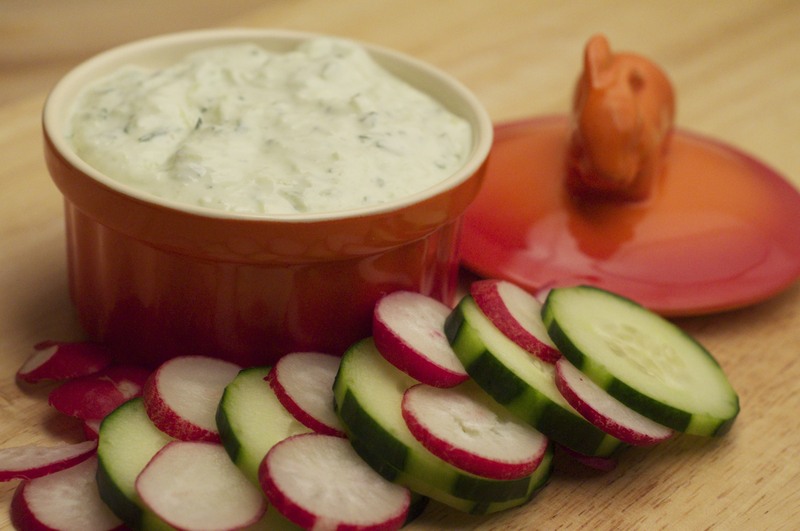 Dip the crudite in the raita for an inexpensive, healthy summer snack. 4. Sandwich sliced cucumbers and cream cheese between slices of rye bread for pretty Cucumber Tea Sandwiches. 5. If you get tired of drinking cucumber water, switch to these Cucumber Basil Mojitos. 7. Garnish something with Cucumber Flowers. 8. Use your cukes and some apples to make this exfoliating sugar bath scrub. Drink some cucumber water while you’re in the tub and place some chilled cucumber slices over your eyes for a complete spa experience! 9. Prepare Ellie Krieger’s recipe for Light Cucumber Salad with English cucumbers, red onions and fresh dill in a tangy sweet vinaigrette. 10. As soon as local watermelon come into season, use them along with cucumber to make Watermelon Cucumber Popsicles. Have you gotten tired of making pesto with all the basil we’ve been getting lately? Yeah, me too. Pesto is great and all, but it does get old. After you’ve made and frozen all the pesto you can stand, check out these other tasty ways to use basil. 1. Add sliced or chopped basil to your favorite canned tomato soup to give it a touch of homemade-ness (is that a word?). My favorite is Amy’s Chunky Tomato Bisque. 2. Layer sliced heirloom tomatoes, fresh mozzarella cheese, and basil leaves on a plate. Sprinkle with salt and pepper and drizzle with olive oil and balsamic vinegar for a classic Caprese salad. 3. Make this caper-basil vinaigrette for salads, or go ahead and serve it on the twice-grilled peppers with Buffalo mozzarella in the same link above. It’s one of our favorite appetizers. 4. Use it to make bruschetta, an Italian spread that also features fresh tomatoes, olive oil, garlic, and balsamic vinegar. Spread it on small pieces of ciabatta for an easy hors d’oeuvre. 5. Muddle it (mash it up to release its flavor) and add to lemonade for a refreshing twist on a summer favorite. If you are so inclined, add vodka to make it a hard lemonade. 6. Use it to make a delightfully herbal bread. 7. Tired of only using basil in Italian food? Try it in this Thai chicken stir-fry. 8. Add a handful of roughly chopped basil to a cup of extra-virgin olive oil and let it sit in the fridge for several days. Strain out the basil, and you have basil-infused oil to use in salad dressings, drizzled over your Caprese salad, or tossed with grilled vegetables. Store in the refrigerator. 9. How about basil in dessert? This basil-blackberry crumble looks tasty. For that matter, try mixing sliced basil with your favorite fruit for an easy summer snack. Peaches and strawberries come to mind first…mmm. 10. Use it in a sandwich with grilled summer vegetables. How else do you like to use basil? What would y’all think about a blog post series called “10 Things to Do with X Ingredient”? I’m thinking it may be helpful to do posts like these with produce we get a lot of, like citrus in the winter and carrots in the springtime, in addition to the recipes I already post. If so, what ingredients would you like to see featured?